Blessed is a Scandinavian island where no children are born and people don't age. The year is 2073 and Eric Seven, a reporter, is sent to write a story about the island. Little is known about the land and its inhabitants, which Eric figures is because the island is off the grid, technologically. He finds this out when he arrives and his phone has no signal. But someone still steals his phone charger, and Eric learns the island isn't as friendly as he first thought. Yet he feels comfortable here, and is drawn to a young woman named Merle. He feels like he already knows her, though she's a stranger. Eric is on the verge of discovery when the story ends and the next takes us back to 2011, then 1944, then 1902, 1848, the 10th century, and a timeless period. 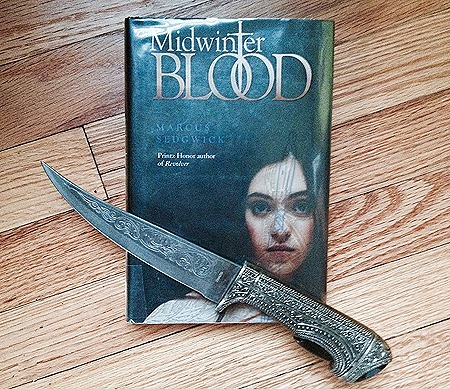 It is hard to write about Midwinterblood without giving away much of the story, which is actually a great problem to have. It's one of those books that can be recommended to teens by saying "You've got to read this!" That being said, it doesn't seem like a typical young adult book. It's very unique in subject matter and the way it's told, but it doesn't seem expressly written for teens. The subject matter is gruesome in several stories, and none of the major characters are teenagers. The writing style is not too juvenile for adults, but isn't laden with slang or otherwise aimed at teens. Still, it seems like a book that will rarely be on the shelves due to its popularity. Teens will be drawn to the mash-up of historical fiction and supernatural elements. Since the book won the Printz Award in 2014, it is destined to become a classic. Sedgwick's seven short stories are tied together with common characters and common themes of love and sacrifice. Each story is written in present tense, drawing in the reader and keeping them in suspense until the final story is told and all the plots are woven together. Until the entire book is finished, some stories, and parts of stories, can be quite confusing. Though this is a short story collection, it's not an easy book to breeze through. Because of the imagery and how much thought it takes to put it all together, this book should be recommended to older teens or those at an advanced reading level. Midwinterblood is a book that will make you think. It stays with you long after you close the cover, and has your imagination working overtime. Capitalize on this inspiration by hosting a writing workshop. Teens can write their own short story collection in seven stage. 1. Love. Write a love story, but don't be constrained by what is typically thought of as a love story. Write about familial love: that of a mother for her daughter, or between siblings. Write about platonic love one feels for friends and neighbors. Explore romantic love, or the love one feels for the gods of their religion. 2. Moons. Each story in the book is named after the type of moon that occurs during that time of year. Look up different moons and see what they represent. Pick one that inspires you and write a story about it, or set during that time of year, or make up a fable about how it got its name. Find moons by the month here. Full Moon Names and Meanings. Moonconnection.com, 2015. Web. 1 Jul. 2015. 3. Reincarnation. Eric and Merle appear throughout the book as different people in different times. What do the teens at your library think of reincarnation? Do they feel like they've lived before? Have they ever gotten a sense of deja vu? Have them write a story about a character who is living a second or third life, or even an essay about what the teen might have been like in a previous life. 4. Historical Times. Piggy-backing off the idea of reincarnation is simply setting a story in a historical time. Teens can pick a time period, research it, and write as if they or their characters lived during that time, or they can create a mash-up. A mash-up is when two different genres are combined; for example, teens can write a romantic story or a science fiction story set in a historical time period. 5. Symbolism. Things aren't always what they seem! Midwinterblood has a lot of symbolism in every story, like the hares, the dragon orchids, the moons, the bonds of love, and more. Have teens write a story where symbolism plays a big part in the plot. Effective symbolism should add depth to stories, not just be extra elements included without reason. 6. Works of Art. Midwinterblood is based on a painting by Carl Larsson entitled "Midvinterblot". Show teens this painting so they can see how it relates to the book. Have them page through coffee table books of artwork until they find a piece that speaks to them. Have them write a story influenced by the art, or about how it was created, or about what is depicted in the art. 7. Sacrifice. This is a major theme in all seven stories. Have teens write about what they would sacrifice to save something, or what has been sacrificed for them. To further the Midwinterblood theme, challenge them to include characters they used in an earlier story, if they haven't been doing that all along. Short story collections written specifically for teens seem to be overlooked in favor of more attention-grabbing novels. Spotlight these great books that will open teens' eyes to short fiction, and might inspire them to write their own - beyond the Midwinterblood Writing Workshop! Black, Holly, and Justine Larbalestier, eds. Zombies vs. Unicorns. New York: Margaret K.
Link, Kelly, ed. Pretty Monsters. New York: Speak, 2010. Print. Silverman, Karen. "Midwinterblood." School Library Journal. 9 Dec. 2013. Web. 11 Jul. 2015. Sedgwick, Marcus. Midwinterblood. New York: Roaring Brook Press, 2013. Print.